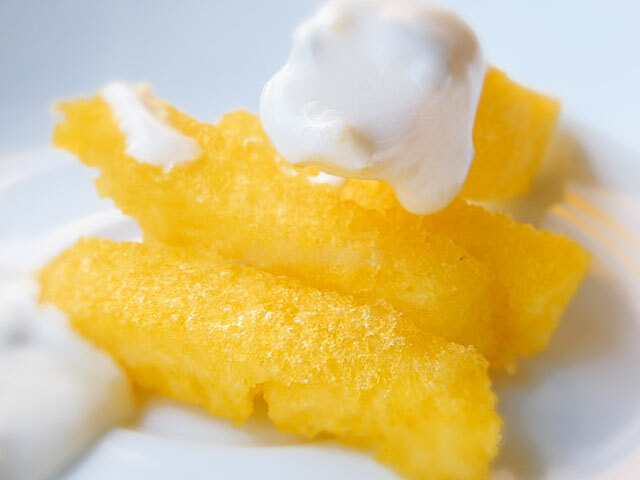 Prepare the desired quantity of polenta, with a rather firm consistency, by adding the maize flour to one litre of water, stirring continually for about 45 minutes. Just before removing from the heat, beat to a creamy consistency with 50 g of butter and the Parmigiano Reggiano Grated Cheese “Cascine Emiliane”. Pour onto a worktop (preferably wet marble) and spread out to a thickness of around 1 cm using a spatula. Leave to cool. In the meantime, mix the Gorgonzola Cheese with the remaining butter in a bowl, to a creamy consistency. Once the polenta has cooled properly, cut into small strips about 2 cm wide and fry until crispy. Drain on absorbent paper to eliminate any excess oil, then arrange on a warm serving dish, spread with the cream of Gorgonzola and serve immediately, piping hot.